Here's a recipe I put together during the summer when our raspberries were ripe and plentiful, and I wanted a different kind of ice cream. 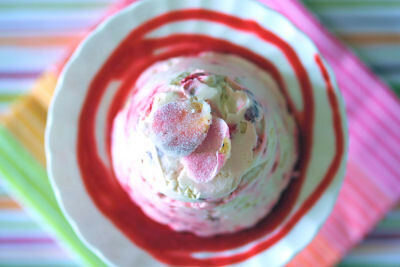 It's similar to an Eton mess but frozen, and the strawberries are swapped for raspberries. I also added some chopped white chocolate - because everything tastes better with chocolate right? I've called it a 'Kent' mess and - you never know - it might become as famous as the 'Eton' one! My mixture was frozen in silicone moulds, but you can pour it into a plastic freezer-proof container and scoop servings out with a spoon or ice cream scoop. Break the meringues into bite-sized pieces. Whip the cream with the icing sugar until it just holds its shape. Mash the raspberries lightly with the liqueur. Fold everything together in a large bowl with the chocolate and spoon into small moulds, I used silicone muffin ones. Freeze for at least 4 hours. They will keep in the freezer for up to a month if well wrapped. To serve, remove them from the moulds and place onto dessert dishes and leave for about 10 minutes before eating. Blend 150g raspberries with enough icing sugar to sweeten the sauce, 2-3 tablespoons or so. Pour the sauce through a sieve or strainer to remove the pips, use a spoon to push the sauce through. 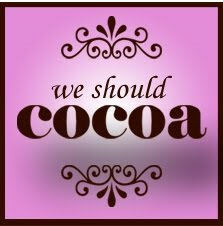 This is going to a new monthly event called We Should Cocoa – a chocolate challenge, hosted by either Choclette or Chocolate Teapot. The idea is to make something with chocolate and include the special ingredient - which happens to be raspberries - and this month is hosted by Chele from the Chocolate Teapot. Now that is a decadent treat at its best! This is absolutely worth creating!!! that is really a supper delicious raspberry. YUMMMY! =) thanks for sharing it! That looks totally scrumptious! I've made Eton Mess with raspberries too, but I've never thought of freezing it. And in the midst of loads of 'here comes autumn' posts, it's nice to read one that's very summery - I don't want to accept the truth just yet! A delightful & lovely sytlish presented dessert!! Oooh ,..;yes! 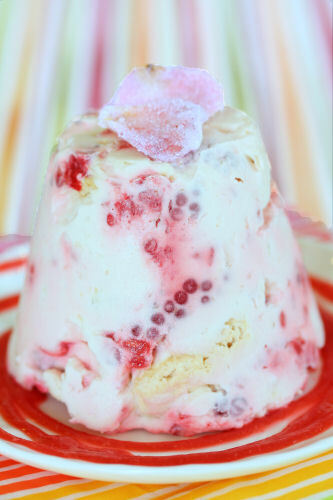 Wound' tthat be wonderful if it get famous as Eton mess, my daughte rloves eaton mess so i am sure she will love your kent mess too. Looks really creamy yumm. What a brilliant idea - I must have a go at this! I have a recipe for Eton Mess on my site and it is a favourite in our house. My mother in law fed us Pavlova with blackberries the other day and I still have quite a few in the garden and I think it would make a delicious combination perhaps with my favourite dark chocolate rather than white: perhaps it ought to be East London Mess in my case, but it doesn't have the same ring as Kent Mess! Looks incredible. My dad gave me a few pints of his raspberries and I couldn't resist eating most of them right away. The dessert looks stunning. What a great idea too. oh wow gorgeous and delicious yum! mmm scrumdiddlyum. My autumn raspberries are still fruiting like mad + enough for the freezer so this recipe will be perfect for creating a little reminder of sunshine in the autumn. raspberry and white chocolate make magic together. nice work! I believe this will become as famous Etons'. Looks a delight to eat! Not made a mess before - well not that kind anyway!! I love eton mess so I know I'd love this. The white chocolate's a nice touch too! 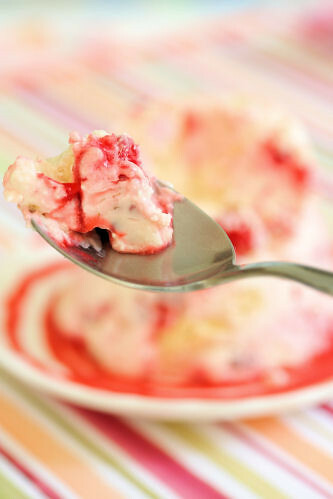 Love this delicious version of Eton Mess! A new take on a classic - great stuff! A work of art. i do not care whatever kind of mess it is - a definitely spectacular mess! OMG! you have any idea how gorgeous that looks ? VERY! OMG NIC (sorry bout the caps) but this looks amazing. It's like one big tower of colourful happiness for me. loving this. it makes my fav eton mess look boring! So pretty, and the chocolate does take it up a notch! This makes a very impressive dessert. 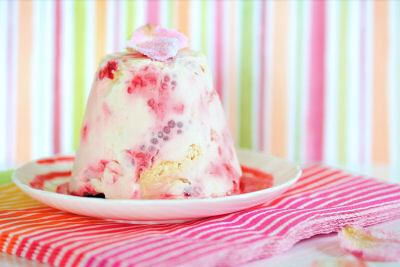 Bring on summer I say and Kent Mess has got to become the ice cream for next year - fabulous idea. And thanks for taking part in the challenge. It is so hot here and this treat would be a welcome relief on so many levels and the riot of colours are inspiring. Black Forest Macarons for Sugar High Friday!